Indiana Zipline Tours is a treetop canopy tour that will offer you a thrill of a lifetime, fit for all ages 3 to 103! Nestled just outside of Crawfordsville, Indiana and minutes from Turkey Run and Shades State Park, our canopy tour consists of 8 ziplines, 1 swinging bridge, a few scenic walks and Indiana’s only suspended platform in the trees! Designed and built with nature in mind, our ziplines are eco-friendly and the most user friendly . . . with NO TOWERS TO CLIMB! You’ll fly like a bird over a mile of zipline cable, ranging from 150′ to 2000′ . 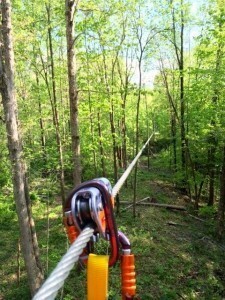 . . Indiana’s longest zipline! So, come and enjoy y our exciting zipline adventure at Indiana Zipline tours with NO highway noise, NO parking lots to see and PLENTY OF NATURE!